Each month we feature a new species. This month we discuss Haminoea alfredensis Bartsch, 1915 (text by Alan Hodgson, photograph by Peter Smith). This opisthobranch gastropod mollusc (Order Cephalaspidea) is commonly known as the Green Bubble Shell and is endemic to South Africa. It is found all around the South African coastline and is very common in estuaries especially on sea grasses such as the eelgrass Zostera capensis (as shown in the image). It feeds by scraping diatoms off the surface of the eelgrass blades. The species gets its common name from its delicate bubble-like shell that does not provide any protection from predators. However, there appear to be very few predators of this snail because it uses chemical defence. Its skin not only produces a lot of mucus, the epidermis is also packed with cells that produce a colourless but noxious secretion, probably acidic in nature. Some species of Haminoea have also been found to emit alarm pheromones that warn conspecifics of danger. Haminoea species, which are hermaphroditic, can display social behaviour during the reproductive period, although this has not been described for H. capensis. 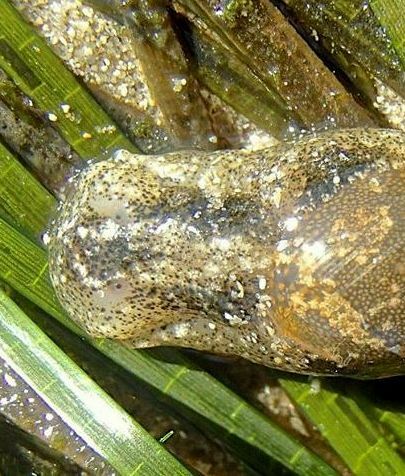 However, after fertilization H. capensis lays spiral yellow egg masses and attaches them to the leaves of eelgrass.